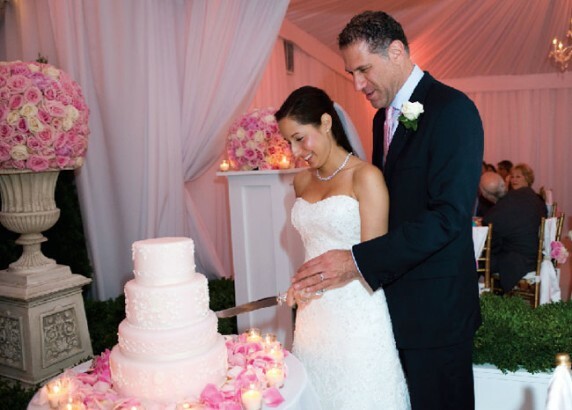 The bride, Amy Weiner — my daughter, in this case — loves crystal, roses, a very pale pink color, and is very sentimental. Michael, the groom, said the magic words, “whatever makes you happy,” so we began to create her dream wedding. Amy loved the home in which she grew up, and her desire was to be married in the backyard. This was going to be a very small, intimate wedding, so space was not an issue. A tent was constructed, complete with flooring, carpeted in ivory. The walls and ceiling were draped in white, and crystal chandeliers lined the aisle. Brick columns were covered with wood, painted white to resemble beautiful English columns, and then topped with rose topiary balls. A very pale pink lighting washed the tent to complete the look. The bridal party entered the ceremony tent from the living room, through French doors, as beautiful music was played by the string quartet. After the ceremony, the guests mingled in the house and on the tented front lawn and enjoyed hors d’oeuvres and Champagne. During cocktail hour, the ceremony tent was transformed for dinner. As tables were set in place, a draped wall was opened and tied back in large swags to reveal another tent already set for dinner. The tables were draped in white Lamour Linens and Lamour-banded chiffon. Glass charger plates, trimmed in gold, exquisite gold flatware, crystal stemware, monogrammed menu cards, and white hemstitch napkins created the place settings. 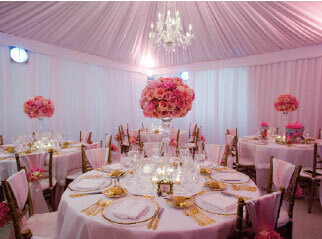 Crystal stands, topped with abundant pink roses, were surrounded by twinkling crystal votives. Guests were seated on gold Chiavari chairs that were dressed with white and pink Lamour sashes, gathered with pearl bands and adorned with bouquets of pink roses. Wonderful music played in the background, the toasts were warm and meaningful, and the String Angels, three beautiful women, serenaded the guests with upbeat violin music. As guests departed, they were given a beautiful crystal heart paperweight as a remembrance of a lovely evening shared by close friends and family. To take this evening one step further, Amy and Michael have carpeted their bedroom and family room with the carpeting from the ceremony tent. View the WHIRL Magazine source article here.